Is your leisure vehicle ready for winter? 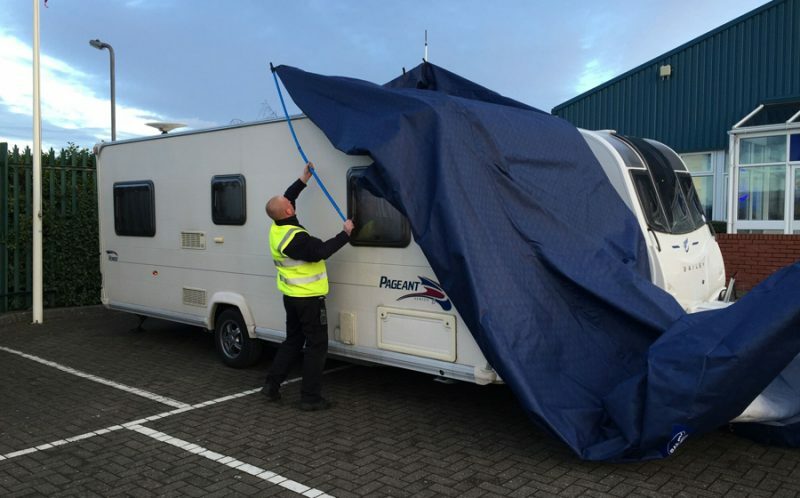 To help you make sure your caravan or motorhome is ready for winter and the colder months, we’re sharing our top 10 tips on how best to winterise your vehicle. 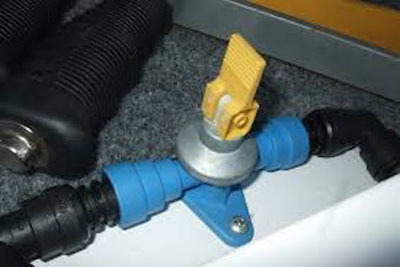 Doing this will prevent even the smallest water droplets from freezing in the pipework. If there is any water in the pipes, it will expand on freezing and could split the pipes. Empty the water heater by lifting the yellow drain lever located near the water heater (Truma/Alde) into the vertical position. The taps in the kitchen, bathroom and shower need to be in the open and central position. Also remove shower hose and leave to drain. For best results also use the ‘Floe Draining Kit’ available at our accessory shop from £36.00. Next, drain the flush water tank to your cassette toilet. This is often overlooked, but is at risk of frost damage and needs to be ready for winter. 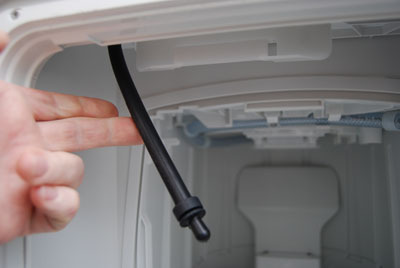 The drain-down pipe can be located in the external compartment which houses the cassette. Remove the plug and make sure that you have a bowl ready to catch any water. If there is no drain-down pipe, flush the toilet until no more water comes out. But make sure that you empty the cassette! It’s recommended that you leave the toilet blade in the open position to prevent the rubber seal from sticking to the blade. Also, make sure you thoroughly clean out the cassette. This helps reduce the risk of mold and mildew building up inside the vehicle. Also remove any items obstructing the air flow vents in the bed boxes and and lower cupboards. Use one teaspoonful of bicarbonate of soda added to half a litre of warm water and clean the interior of your fridge or freezer to get it ready for winter. 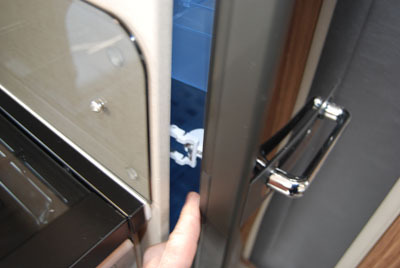 Leave the freezer door propped open with a piece of folded tissue or card and leave the fridge door slightly ajar to allow airflow and stop mildew – use the fridge storage catch if possible. Storing your caravan upholstery in a heated house is also a good idea, keeping your upholstery indoors keeps damp-free in the winter. 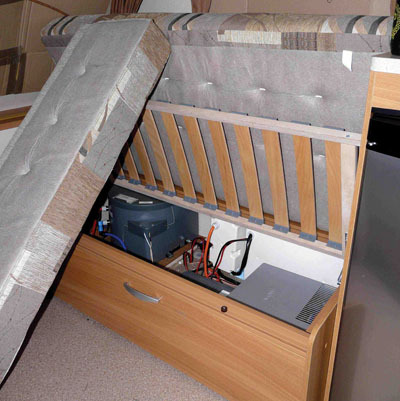 If you don’t have space at home to store the upholstery, stand each section on its end in the caravan so that there is airflow all around it. This helps prevent tension loss in the blinds for future use. If security is a concern, then draw the curtains instead of closing the blinds. Wheel clamp, hitch lock and alarm as per your own insurance policy. You can get extra security devices, including locking wheel nuts, wheel clamps and hitch locks from our security accessories department. This helps prevent corrosion to vital areas including the towing plug(s). If possible, use a hitch cover. Hitch covers are available in our accessory shop for £9.99. This gives the vehicle extra stability in windy and inclement conditions. This helps reduce black streaks that build up over the winter months. For best results use a caravan cover, which helps protect your caravan from the weather, bird droppings, tree sap, algae and falling leaves. We would recommend a breathable cover, which helps to allow the moisture to escape, preventing condensation and mold building up. Avoid using tarpaulin as this isn’t breathable and is prone to coming loose in high winds. 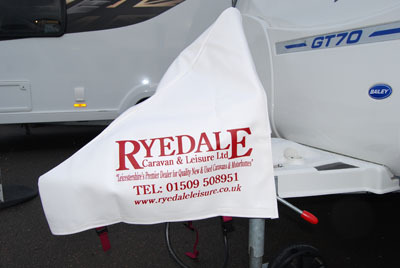 Caravan covers are available in our accessory shop for £99. Your leisure vehicle is now ready for winter and has now received the TLC it needs to get through those cold and dark months ahead!